Discussion in 'Shooter Games: The Range' started by Trouble T, Jun 16, 2018. Quake Champions is a fast paced and challenging first person arena shooter. For those players here whom are truly old school, you already know what Quake is. This is the newest version of the game which started beta testing last year. The game continues to get better and better and I think its still free to play. So I would like to invite all of The Older Gamer's to join me on Steam to play this great game together! You can find and add me on Steam using the link below. In QC by adding friends we get the ability to set up custom games, play as a team or 'party', run 2v2 matches, 1v1 duels and more. It would be fun to get a TOG squad going if we have any interest. Ned and newfulla like this. tried it for a weekend. it's yet another polished title hoping for an online community to give it life. 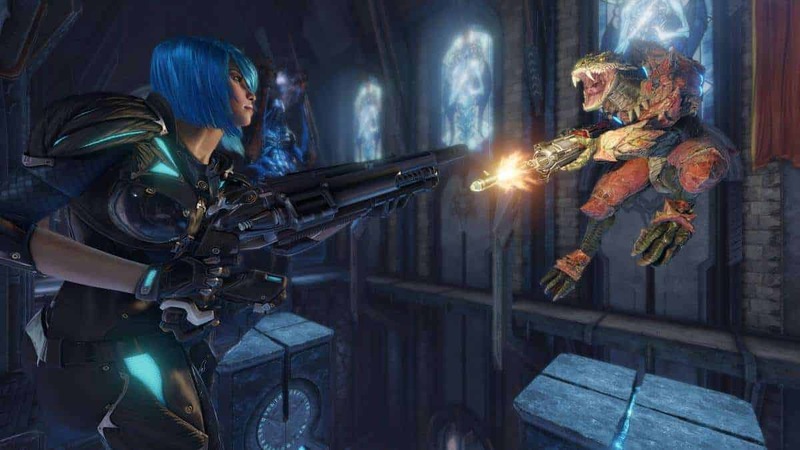 Frag for free as Quake Champions drops its initial entry fee! It's a fun game, really worked out my ancient twitch reflexes, plus my son has also picked it up to enjoy. Quake Champions brings back The Longest Yard and some fun arcade playmodes! WOWzers !! I am really excited about this one! Haven't played that map since way back in the day. Thanks for the years TOG! Any quake3 fans out there. Think quake3 with a bit of CPM and current graphics. Highly optimised engine. runs smoooth. I pulled back the FOV to Q3 levels. I never did like playing in tunnel vision. They should make this option more obvious or make people choose at the start. i think high FOV for beginners would be off putting. I pulled back the FOV to Q3 levels. I never did like playing in tunnel vision. I know exactly what you mean! I used to be the same way. It took me a while to get used to it but now I'm playing on an ultrawide monitor with the field of view maxed and it is absolutely AWESOME! Optical distortion is almost comical on the edges when you get really close to another player. I think it is very much like our real world first person view, the way we actually experience the world around us. How about your Strafe Jumping skills? Are you doing it right?? For those not familiar this is a key mechanic to increase your movement speed and hopefully decrease your incoming damage. And after all these years guess what? I just learned on youtube that I've been doing it all wrong! Uggg... Well there is a proper method and it's not just random jumping and timing like I thought. So here is the video for any that are interested. It runs about 10min. As soon as the new update is installed I'll be going in to start practicing this. Enjoy and happy strafe jumping! With the latest update we got a new champion 'Athena' and a new game mode 'Slipgate'. Athena is an absolute riot to play! Her ability is grappling hook and it functions just like the old Q1 version (except you cant hold it down to stay attached). But it does temporarily stick to other players as you would hope and expect. Apparently she is a character from Q2 that some of you may remember. I don't, so I may have to do an oldschool play-thru one of these nights. Slipgate game mode is super fun too. Its basically team deathmatch with 1 base on the map. Teams take turns either attacking or defending the base, and you get just 1 life per player per round. The team that wins the round gets 1 point, and 5 points total wins the match. So for anyone wondering, I tried training up my strafe jumping skills with what i learned from that video above, but quickly lost interest. It's HARD! I trained for like 10 minutes and then was back to fragging it up in my own tried and true style. Turns out I'm terrible at strafe jumping, and still pretty good at this game. Tuff to teach an old dog new tricks I guess!! I used to love the Hook and Rail in Q2, there were 2 types, The rope which you could use like a pendulum effect on corners etc. and then the later version which was a laser and a lot quicker..
Well here's the latest and as always, sounds great to me! (and thank you very much)! The update on Steam is coming in at 14.5 GB so its a biggie.